Albany CA: the high school, 1996. 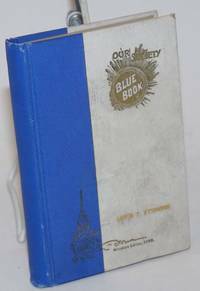 160p., the usual yearbook format but a little taller (11.5x8.5 inches), the photos and jokes snarkier than exemplars from earlier decades, a bit edgeworn with faint damp-ripple to text leaves, a handled copy with numerous jocular inscriptions to "Jack," the senior whose book this was. 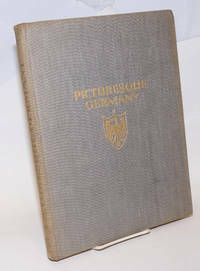 Find more than twenty substantial handwritten paragraphs and a lesser number of autographs at photoportrait sites. 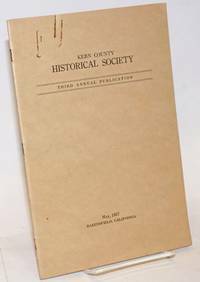 Los Angeles: Historic Record Company, 1924. 1,255p., for re-casing. The textblock (including headbands and blanks) is very good, but casing's hinges are broken and its leather backstrip and corners are decayed. Preserved remnants of the spine panel show how titling goes. Endsheets are easily salvageable (but the book's marbling is inferior). Textblock printed on alkaline glazed stock; clearly reproduced period photos are scattered throughout the biographical sections; there are unfortunately only a few site pictures. 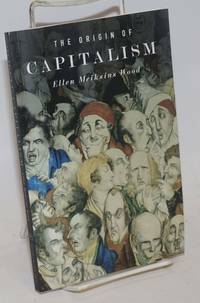 A reading copy that could usefully be re-bound. 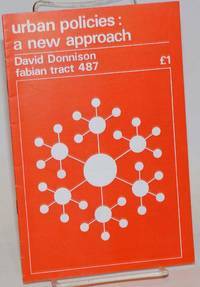 London: Fabian Society, 1983. Pamphlet. 12p., 5.5x8.5 inches, stapled pamphlet, pictorial wraps, else very good. Fabian Society Tract No. 487. New York: Praeger, 1988. Hardcover. 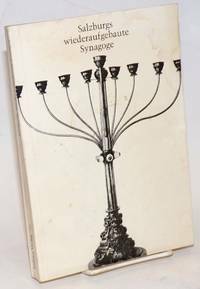 xvi, 187p., illustrated with b&w site photography and tables, first edition hardbound in grey cloth boards titled in cream-white. A sound copy, clean and unmarked. One site in particular is described in detail, Harlem Park, "a predominantly black, low-income neighborhood in Baltimore's inner city"; the writer is a South African who moved to the US to do graduate studies, and stayed. 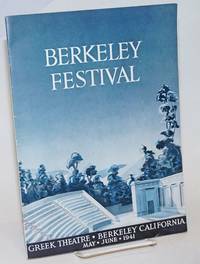 Berkeley: The Berkeley Festival Association, 1941. Pamphlet. 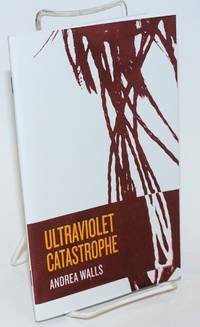 Unpaginated, about 32p., printed on semi-coated partly acidic paperstock and stapled into 10.5x7.5 inch pictorial wraps. Laid in, same size on same stock, a 4p program for the 12th Night production. All paper is somewhat toned, program has some creasing, a very good copy. 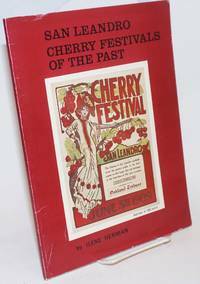 From the Foreword : "This festival, which so fittingly commemorates the seventy-fifth Anniversary of our City, is a declaration to the Nation that Berkeley has assumed its place as a leader among cities.." [send for a free handkerchief soaked in tear gas..]. By Dawson, George E., editor, Carl I. Wheat, Roy Vernon Sowers et al. San Francisco: Edwin & Robert Grabhorn, 1954. Hardcover. 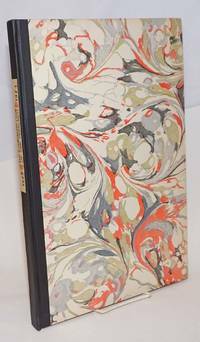 Unpaginated, 10.5x15.5 inches, essays, chronology, illustrated with 26 plates, limited edition of two hundred copies in marbled boards over black cloth spine and paper titles on spine. Plates in lovely subtle colors, text-heads rubricated throughout; especially nice balanced presswork even on chronology and member-list, but of course all two hundred copies were going to friends, to worthy competitors and to customers. 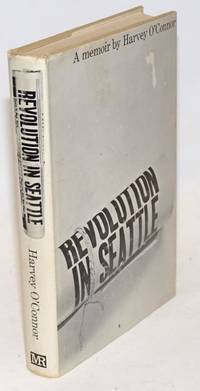 The spine label is faintly toned, foredges of covers unobtrusively toned from handling, completely sound, square and flat, a very good copy. San Francisco: Relocation Consultants, 1981. Magazine. 36p. 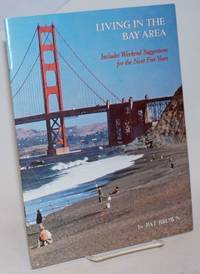 includes covers, 8.25x10.75 inches, populations, housing, rentals, food, entertainment, parks, transit, taxes, illustrated with color photos, figures and tables, maps, very good booklet in stapled pictorial wraps with wraparound photo of the Golden Gate Bridge. Interesting look back at nearly 40 years ago. 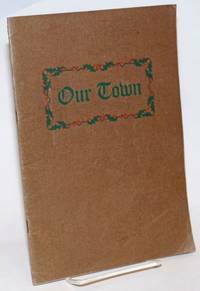 Housing median cost was $200,000, rental of a two bedroom around $500, the only bookshop mentioned is the late lamented Howell's, the last earthquake was 75 years earlier (Mr. Brown had a big surprise coming in just 8 years!) and the skyline was a good deal shorter! 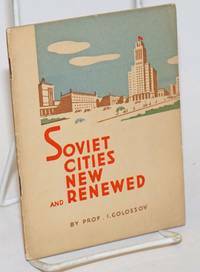 Moscow: Foreign Languages Press, 1939. 30p., 4.25x5.5 inches, photos, very good in original stapled pictorial wraps. 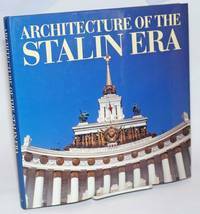 Part of the series produced for the Soviet Pavilion at the World's Fair in New York. Ann Arbor: Center for Chinese Studies, The University of Michigan, 1979. Paperback. 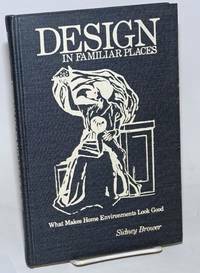 81p., illustrated with floorplan and traditional organizational chart of typical establishment, has an appended glossary with characters. Softbound, 9x5.5 inch decorated wraps, externally a little edgeworn with irregular sunning, internally find an owner's presentation inscription, an otherwise clean sound copy. 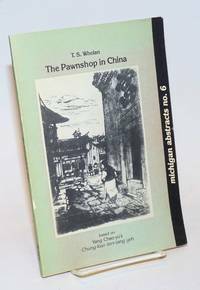 Michigan abstracts of Chinese and Japanese works on Chinese history, no. 6. Originally published in Chinese, Shanghai 1929. Philadelphia: Thread Makes Blanket Press, 2011. [40p.] in stapled wraps. Very good. Poetry "culled from a larger work-in-progress" in which the poet reflects "upon a lost childhood landscape and the social-political and geographical contexts that allowed for this unprecedented event in American history. 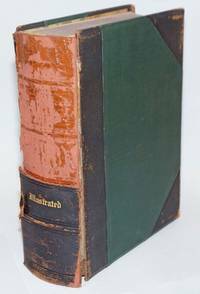 New York: Brentano's Publishers, 1925. Hardcover. xv, 304p., briefest of prefatory notes and a line map of Germany. 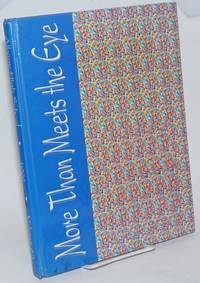 Profuse fine fullpage plates, captioned; hardbound, gilt-titled on grey cloth, 12x9.5 inch boards. Spine a bit faded and dim, corner-tips turned slightly, a very good sound copy with no ownership or other markings. Black and white photography reproduced in clear sepia rotogravure. Orbis terrarum. Landscapes occur towards the end, the bulk of the images is of dense two and three storey medieval-era dwellings linked like jigsaw puzzle pieces. Mostly exteriors; interiors of only a few large public buildings. Cambridge, MA: The M.I.T. Press, 1967. Hardcover. xiv, 154p. + 16 pages of plates at rear. Very good in bit soiled and egdworn dj, bookplate to front pastedown endpaper. 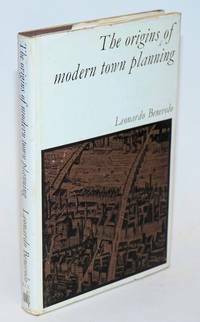 Looks to the work of socialist and 'Utopian' reformers as inspiration for town planning before it became a 'purely technical affair. '.